Actress Michelle Pfeiffer wearing the Victoria-Transvaal necklace. 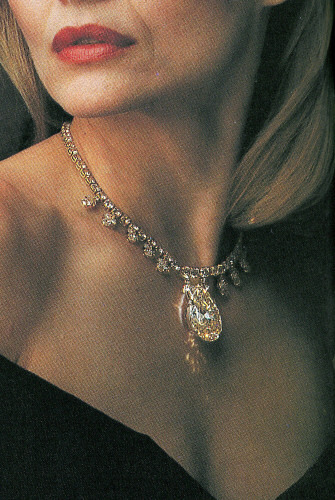 The necklace was designed by Baumgold Brothers, Inc, and consists of a yellow gold chain with 66 round brilliant-cut diamonds, fringed with ten drop motifs, each set with two marquise-cut diamonds, a pear-shaped diamond, and a small round brilliant-cut diamond (the total weight of the 106 diamonds is about 45 carats). The necklace was donated by Leonard and Victoria Wilkinson in 1977 to the Smithsonian Institute, Washington D.C.
oval-shaped diamond, and the yellow Oppenheimer Diamond Crystal in the back. Photo by Chip Clark. 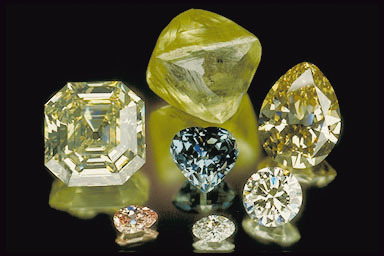 Sources: Diamonds - Famous, Notable and Unique by GIA and The National Gem Collection by Jeffrey E. Post.